Whats more fun than a room full of black lights with everyone and everything glowing in the dark? 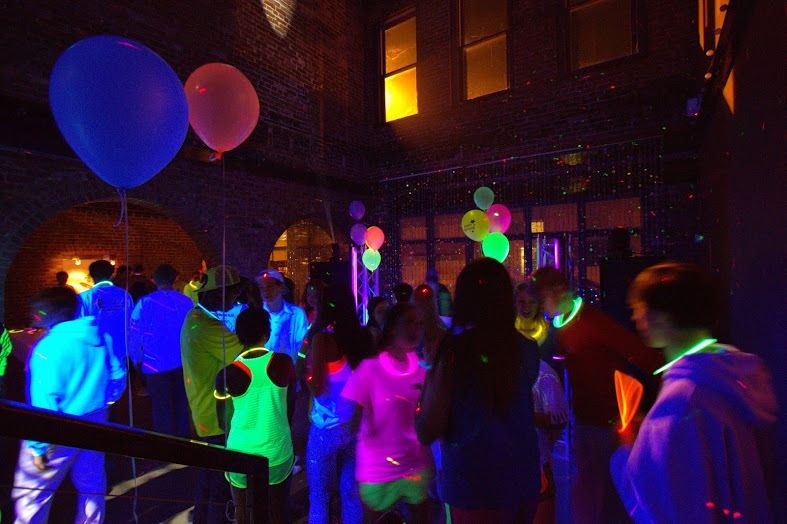 The blacklight party is a great way to get all your friends dancing together and having a good time. Make sure you get as many glow decorations as possible. You can even get beer pong cups that glow under blacklight, the regular cups don't glow. Allow your guests to get as creative as they want. Get out some highlighters and make it into a Graffiti Party. Everyone will be writing all over each other and once you get under blacklight you can see all the funny things people have written on you. Set up your blacklight party is in the largest room in your house. Before you start the party you need to move all your furniture and valuables into a different room guests won’t be in. You also need to try to block as much light out as possible. You don't want to cops driving by, seeing your awesome party and shutting you down. Dress casually and wear something that has white in it to best glow under black light. Think about what piece of clothing would look the best under blacklight a which that has white patterns in it will look awesome. Also wear something that you don’t mind getting ruined if the party turns into a Graffiti Party with everyone tagging each other with highlighter or glow paint. If you are feeling like having an even more wild party then have your guest cover themselves with glow paint, or laundry detergent to save some money.